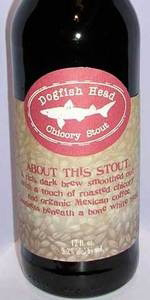 Chicory was one of the first beers we started brewing at our pub back when it opened in 1995. It's a dark beer made with a bunch of roasted chicory, organic Mexican coffee, St. John's Wort and licorice root. We use whole-leaf Cascade and Fuggle hops, as well as pale, roasted and oatmeal grains. Like finding Bigfoot (not the beer) here is a rare sighting, the rare, relatively straight forward Dogfish Head beer. Pours almost black. Plenty of roast and I guess that is chicory I'm picking up in addition to it. Mild smoke. Taste is just a straight forward roasty, mildly smoky, chocolate and coffee from the malt mouthfeel with a hint of adjunct coffee. The licorice is muted, and it comes across smooth overall.